We’ve been working with Dinny Hall for a few years now and we love the ideas and concepts they come up with for their shop fronts. The business is growing and they now have 4 London stores supplying stunning jewellery. 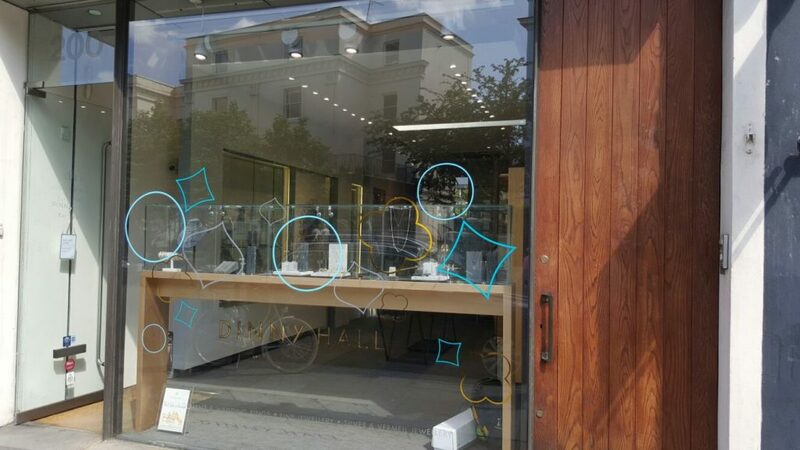 The picture below shows their Westbourne Grove store where we supplied and installed a series of vinyl cut stickers to the inside of the shop window. We’ve been supplying shop window stickers since 2006 and have a wide range of ready made designs to choose from on our website. For bespoke orders with or without installation, please contact us: installation-service@purlfrost.com. Our installation service covers London and Greater London, and the Home Counties. What Are The Benefits of using Solar Control Window Film?